Tim Toyama conducts the Sansei Stories workshop at the Gardena Valley Japanese Cultural Institute. The next session starts on Jan. 20. The popular “Sansei Stories” workshop will begin a new six-week session on Wednesday, Jan. 20, from 7 to 9:30 p.m. The workshop is sponsored by The Bridge: JCI Heritage Center at the Gardena Valley Japanese Cultural Institute. “Sansei Stories Workshop was informative, interesting and provocative. Best of all, it’s supportive and fun,” said Chris Taga. Everyone has stories to tell, to pass on, to give. Sansei Stories is a workshop that provides an opportunity for writing and telling stories about growing up, about experiences, about friends and relatives, about lessons learned. Stories developed in the workshop have appeared in The Rafu Shimpo and Pacific Citizen. Many writers have performed their stories at the GVJCI’s monthly Second Sunday Jam sessions to enthusiastic audiences. 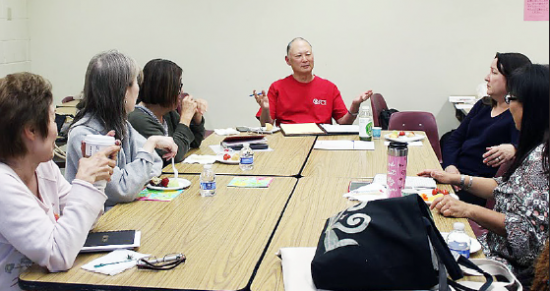 “The Sansei Stories workshop was an affirmation and validation of me as a writer, which means a whole lot to me,” said I. Sanaye Takenaka-Furukawa. Everyone, from new to published writers, is welcome to participate, and their stories will be workshopped in a warm and nurturing environment. No topic is off-limits; past topics ranged from a Vietnam veteran’s homecoming, to fond memories of growing up in Crenshaw, to dealing with aging relatives. “Taking the Sansei Stories writing workshop has made me investigate deeper into my interest of Japanese American identity and pop culture…. Sansei Stories rocks! Best class ever!” said Yoshie Sakai. The workshop is limited to eight people, so sign up quickly in order to ensure your spot. For more information, contact Michelle Yamashiro at [email protected] or call (310) 324-6611. There is a $30 workshop fee. The workshop will meet at the GVJCI, 1964 W. 162nd St. in Gardena.